What a month this has been! I can’t believe my cookbook has been published only 4 weeks ago and so much has happened already. I wish to thank you, my friends, for the incredible number of messages, compliments and congratulations from all over the world, from the US, to Singapore to Australia. 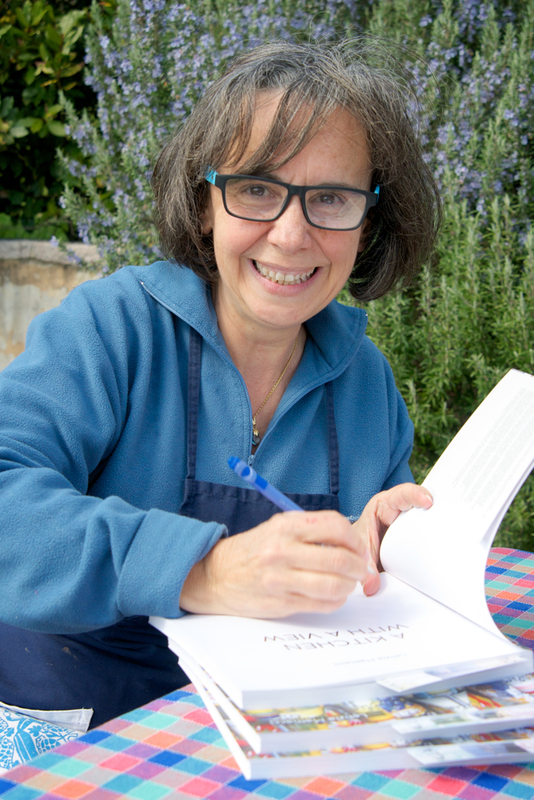 And of course I wish to thank so many of you who have ordered the cookbook and patiently waited for the slow Italian postal system to deliver it. Before starting, please revise how to make pasta sheets here and how to make ravioli here. 30 gr (about 1 oz) dry porcini mushrooms, cleaned and soaked in 3/4 cup water until soft, about 10 min. Saute mushrooms in 1 tablespoon olive oil until cooked through. Make sure to cook the mushrooms on high heat so they will not release liquid and become soggy. Take off the heat, add one finely minced garlic clove. Set aside to infuse. When at room temperature, pulse chop in a food processor together with the ricotta and 3 tablespoons Pecorino until finely diced. In a food processor blend the flour and egg at high speed until it forms a ball. The dough can be used immediately but may be made in advance and covered with a cotton tea-towel. A resting period relaxes the gluten in the dough and makes it easier to roll it. 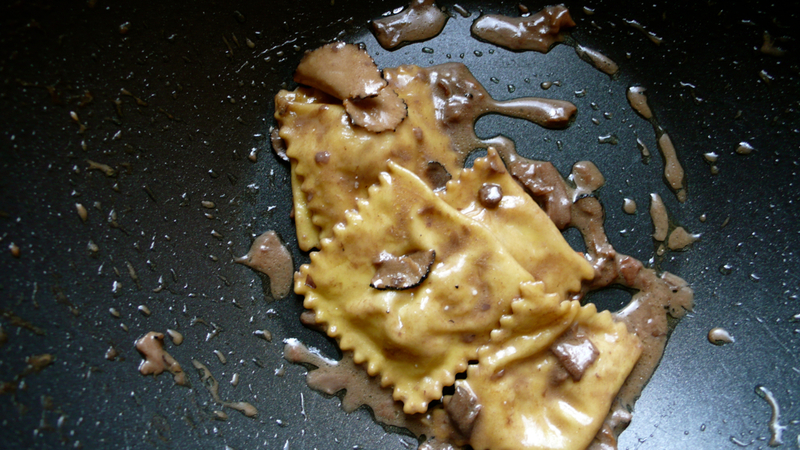 While the pasta dough is resting, start making the porcini sauce. Saute the finely minced garlic cloves in 1 teaspoon of butter and 1 tablespoon olive oil until fragrant. Add porcini with their soaking liquid and simmer slowly, half covered, until bubbling and slightly reduced. Add the red wine, two tablespoons at the time and keep simmering until all the wine is added and the mixture is reduced to about half of the liquid added (i.e. soaking liquid plus wine). Roll the pasta dough into rectangular strips. Put teaspoons of the mushroom and ricotta filling about 5 cm (2 inches) apart on the sheet so that you can make a “parcel” by folding over the pasta sheet. Using a ravioli wheel-cutter seal each parcel by cutting on three sides. There is no need to cut the fourth side, i.e. the fold. Carefully place the ravioli on a dry cotton towel taking care that they do not overlap otherwise they will stick to each other and break. Bring to the rolling boil a large pan of salted water and cook the ravioli for 3 minutes. Drain, reserving the pasta water and transfer the ravioli into the porcini sauce. Simmer over medium heat until all excess liquid is absorbed, add mascarpone and sprinkle with grated Parmesan and 1-2 tablespoon of pasta water if needed to melt the cheese and obtain a glossy finish. Add the truffle slices, stir in one last time and serve immediately. Congratulations on your cookbook. Please let me know how I can order a copy. A new cookbook and a new look to your blog page. Congratulations. and a great recipe too. Hi Letizia! I recognize this photo! Thank you for the lovely day! We love the cookbook! I am making the lunch we made while with you for our parents this weekend! thank you Trisha, so lovely to hear from you! Enjoy the Umbrian lunch! This is Paula & Larry… We purchased a pasta machine and made the pasta we made with you during our cooking class. OMG, it was so easy and delicious. Thank you again for such a wonderful day with you, Jack & Anna (from Australia). Next will be the Saltimbocca di maiale al Vinsanto…. Your cookbook is fantastic! Hope your summer goes well on that magical mountain!! thank you Paula and Larry, enjoy the cooking and a wonderful summer! my book is a completely home made operation and for the moment my publisher is only selling the print version directly until we can manage all the red tape needed for amazon dot com, one copy costs 30€ including international shipping. Now we are busy with the B&B and cooking school activities but in the winter I should find the courage to format the pdf and make an ebook of it. Hopefully it will not be too difficult! Saluti! L.
This recipe sounds very interesting, and I may just prepare it for a truffle celebration soon. What sort of wine would you serve it with? I hope my answer does not come too late, a well aged red is what you need with truffle and mushrooms!